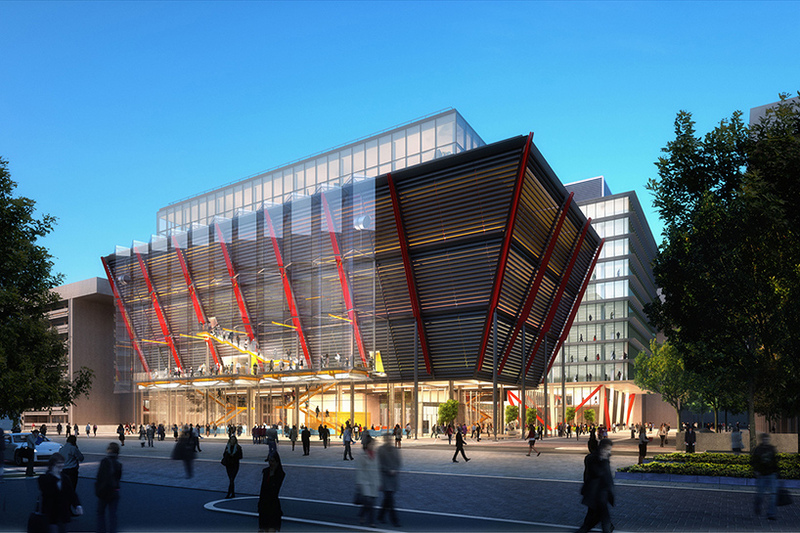 British architect Richard Rogers and his London-based firm Rogers Stirk Harbour + Partners (RHSP) saw construction break ground on the not-so-well hidden International Spy Museum in Washington D.C. Situated on L’Enfant Plaza, the 140,000-square-foot museum is part of wider effort to reinvigorate the area. It will replace the current 19th Century building located in Penn Quarter. According to a press release from RHSP, the new museum will offer a "glass veil" that will be draped in front of a "enclosed black box exhibition space." This will let the buildings circulation be viewed from both interior and exterior perspectives, something that the architects say will contribute "new energy along 10th Street." The "sense of veil" and "black box" will also be visual cues evoking the secrecy and mystery associated with espionage. 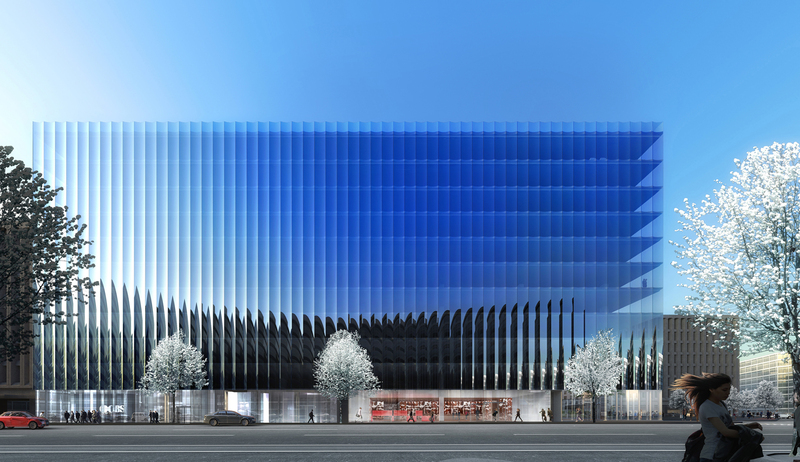 "Behind this veil, the prominent facade of the box angles out over the street and public space to one side, breaking the building line to create a disruptive landmark at the crest of 10th Street, visible from the National Mall at one end and Banneker Park at the other," the firm said. In addition to this, the new building will also expand exhibit and educational spaces, including a theater and "unique" event spaces. The aforementioned event spaces and a roof terrace will be located above a double-height lobby. Working with the Malrite Company from Cleveland, who founded the museum, the District was able to make sure that the museum stayed in D.C. “As a Navy veteran, I, along with my family, take pride in setting the stage for the International Spy Museum to grow," said Milton Maltz, the founder of The Malrite Company. “We consider it essential to ensuring the contributions of the dedicated men and women who serve in our intelligence agencies. They are recognized for the invaluable roles they’ve played in winning wars and protecting Americans at home and around the globe.” "The international spy museum has long been a destination for residents and visitors, finding innovative ways to keep us connected with our past," said D.C. Mayor Muriel Bowser. "The new museum will be a welcome addition to southwest as we continue to attract businesses and expand economic opportunity." The museum is due to open at some point in 2018, however, the museum's lease at its current location at 800 F Street NW is set to end in 2017. Bellhops dressed in Sixties-themed uniforms created by costume designer Janie Bryant from the Mad Men television series. Guest rooms that resemble cabins on a cruise ship, only filled with midcentury modern furniture. Guest room keys bearing a message that makes a not so subtle reference to the Nixon era: “No need to break in…” Those are just a few of the design touches guests will find at the Watergate Hotel, on the banks of the Potomac River in Washington, D. C. Located at 2650 Virginia Avenue N. W. and closed since 2007, the hotel reopened today after a six-year, $125 million renovation. As part of the work, the number of rooms has increased from 251 to 336, including 32 suites. 17,000 square feet of meeting and event space have been added, including a 7,000 square foot ballroom. The developer is Euro Capital Properties of New York, headed by Jacques and Rakel Cohena, a husband and wife team. The architects were BBGM of Washington and Ron Arad Architects of London. Room rates start at $435 per night. Originally designed by Italian architect Luigi Moretti in 1961, the Watergate Hotel gained attention for its contemporary design, and it came to epitomize the lifestyle and sophistication of its time. In the latest renovations, the 1960s exterior was preserved, but the interior was gutted and rebuilt. The architects put emphasis on playing off the midcentury modern design and playing up the sense of retro luxury and swank that distinguishes this hotel from more traditional Washington hotels such as the Willard InterContinental on Pennsylvania Avenue. Much of the furniture has been designed to look as if it dates from the 1960s. In a nod to the hotel's Italian heritage and inspired by its curves and undulations, Arad looked to sculptural, modern furnishings by the Italian designer Moroso. Arad also designed a new whiskey bar that's marked by a sculpture made of metal and whiskey bottles. The rooftop bar has a fire pit and sweeping views of the Potomac River, the Capitol, and the Washington Monument. 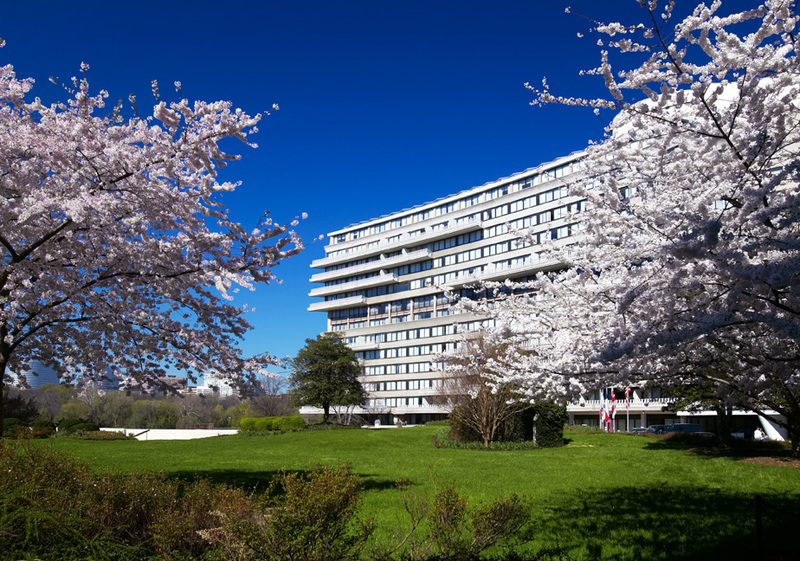 The designers and developers didn't shy away from the Watergate’s link to the break-in that brought down a president. The hotel's customer service phone number ends in 1972, and recordings of Richard Nixon’s speeches will play periodically in public restrooms. “The Watergate is undoubtedly one of the most glamorous and illustrious hotels in the world," said Rakel Cohen, senior vice president of design and development for Euro Capital Properties. "We have paid meticulous attention to every detail in its renovation…. Its intrigue is driven by evocative design, from the retro feel that we have infused to the mystique that lies behind every curve of the hotel's architecture." Four finalists have been named in the “Memorials for the Future” design competition, launched to find new ways to create, experience and think about memorials in the nation’s Capitol. Competition sponsors on Wednesday announced the finalists, who were selected from a group of 30 semi-finalists by an 11-member jury. The jurors originally planned to name three but ended up adding a fourth that they didn’t want to eliminate. 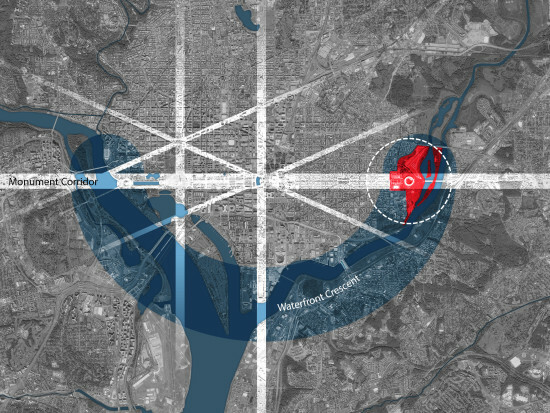 The proposals were very different from each other, ranging from a series of oral histories of significant places, told by a “roving flock of bright parrot-like automated story tellers,” to high definition videos of national parks projected inside the Anacostia Metro station, to disappearing rows of cherry trees that would show the effect of climate change and rising sea levels. The competition was organized by the National Park Service, the National Capital Planning Commission and the Van Alen Institute. The finalists will be asked to ask to take part in a research and design process that will lead to proposals for site specific memorials in Washington, D. C. A winner will be named on September 8. The finalists are: American Wild: A Memorial Team: DHLS. Members: Forbes Lipschitz, Halina Steiner, Shelby Doyle, Justine Holzman American Wild virtualizes the National Parks through an interactive, immersive installation. Using ultra-high-definition video, recordings of each 59 natural parks can be projection-mapped at full scale. Audio recordings heighten the visceral experience and establish emotional connections to the landscape. The memorial democratizes National Park access by creating an installation in one of the most economically and racially diverse neighborhoods in the nation’s capital. Full scale, immersive environment design expands access to both phenomenological experience and ecological understanding. In so doing, the memorial reinvigorates the ways in which we interact with the cultural and biological diversity of the American landscape. Climate Chronograph Team: Azimuth Land Craft. Members: Erik Jensen, Rebecca Sunter A platform for witnessing rising seas, the Climate Chronograph is a living observatory for an unfolding global story. As seas rise, cherry trees die in place, becoming bare branched delineations of shorelines past. Over a lifetime, a visitor will experience the same place in its ever-changing condition, a legible demonstration of generational-paced change. This new memorial is continually becoming, and in doing so offers a new approach to monumentality. A light human hand sustainably initiates a profound pastoral meditation. This landscape chronograph marks both our vulnerability and our response. It records the challenges before us. The IM(MIGRANT) : Honoring the Journey Team: Honoring the Journey. Members: Radhika Mohan, Sahar Coston-Hardy, Janelle L. Johnson, Michelle Lin-Luse The experience of movement and migration is the elemental experience of what it means to be an American. Leaving home, hopeful and expectant, and meeting hostility and kindness, misunderstanding and acceptance. Overcoming obstacles fueled by ambition and resourcefulness. Making a new home among people familiar and strange. Immigrant experiences, including those of native peoples, are at the foundation of the national psyche. They are also experiences that divide our country and have been a part of our political debate since the country’s founding. THE IM(MIGRANT) is a proposal that responds to these ideas, reinforcing core American beliefs by unfolding and commemorating the varied journeys that grandparents, parents, brothers, sisters, cousins, aunts, uncles, friends, and strangers have taken through the landscape of Washington, DC. It offers the visitor access to the experience of movement, of arrival, and of making a new home. VOICEOVER Team: Talk Talk. Members: Anca Trandafirescu, Troy Hillman, Yurong Wu, Amy Catania Kulper VOICEOVER: histories, memories, and flights of fancy. VOICEOVER is a project that embraces a spirit of revisionism as a means toward a broader and more democratic form of national memorialization. Rather than a freestanding monument, VOICEOVER is a supplemental overlay that expands the original monuments’ meanings and extends the territory of possible memorial subjects deeply into Washington DC’s urban fabric. Fragmentary and dependent by nature VOICEOVER makes no claims toward cultural conclusions on historic events. Rather, VOICEOVER is a loud call to reawaken a nation to its relevant and multi-faceted pasts. It gives voice to the diverging understandings and conflicting perspectives of a multi-cultural society. Thirty semi-finalists for the Memorials for the Future competition have been announced. Launched in mid-April, the competition was organized by the National Park Service (NPS), the National Capital Planning Commission (NCPC), and Van Alen Institute, and seeks a design concept for a temporary memorial somewhere in Washington, D.C. (see our prior coverage here). Part of the competition criteria was that the memorial be adaptive to different perspectives/narratives, ephemeral, virtual, interactive, or event-focused. One semi-finalist submission, The Installation of 6 Million Stars, commemorates the victims of the Holocaust. This interactive memorial consists of two joined open triangles whose lights can be activated digitally (i.e. remotely) or by touch. While certain details on this project are forthcoming, the proposal states that selecting a light would lead you to more information on a Holocaust victim’s name and his/her biography. Because the lights can be activated from different places and at different times, the memorial would be constantly changing. The Installation of 6 Million Stars intends to encourage the participation of young people through its digital interface. Among the many semi-finalists that utilize digital technology is M.A.R.K. (Memorial Augmented Reality Key). M.A.R.K. consists of physical markers and a M.A.R.K. mobile device app. When a marker is scanned using the app, your phone can display different points in history of the landscape, “[adding] a visual and auditory layer of history to the existing scene,” according to the design summary found on the competition’s website. RFID, GPS, and your camera allow this virtual reality to be accessed. A timeline on your phone's screen acts as a time machine, from which users can select a time period to see the surrounding landscape. At a time when virtual reality experiences are exponentially gaining popularity, this type of memorial aims to fit into the dynamic environment of D.C. and encourage a broad audience to engage with history. A less digitalized memorial is Memorials for the Future Lost Cities which commemorates cities that will likely be radically changed or destroyed by the rising sea level. An elevated pavilion-like structure located on Hains Point would include “a small exhibition space, a covered picnic/play area and a server to host a digital library.” The library will document the history of these “future lost cities.” Of the semi-finalists, many pay tribute to American history, environmental concerns, or current issues such as terrorism and gun violence. Finalists will be announced on June 8. Donald Trump may want to build a wall on the border between the U. S. and Mexico, but the Obama administration is more focused this week on building a new fence—around the White House. 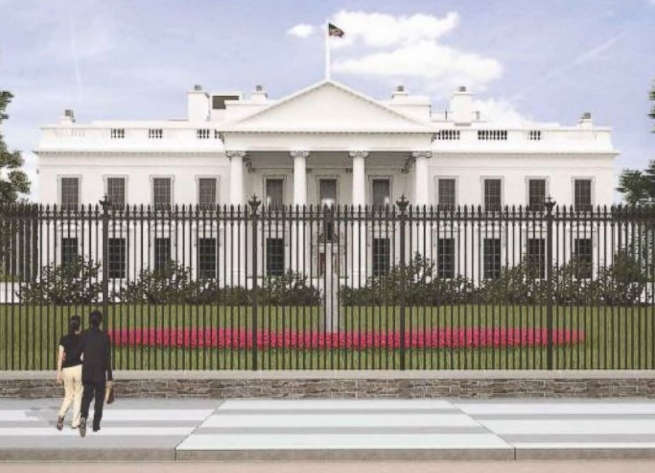 The National Capital Planning Commission was briefed Thursday on plans for a new White House security fence that would roughly double the height of the existing one and have a new concrete foundation—a response to the recent rash of “jumpers” and intruders who have tried to break into the 18-acre compound at 1600 Pennsylvania Avenue. “We would like to be able to ultimately rebuild the fence as it stands right now. This is an immediate need,” said Tom Dougherty, chief strategy officer for the Secret Service. “The current fence simply is not adequate for a modern era,” Dougherty said in an earlier briefing to federal officials, a recording of which was broadcast by NBC News4 in Washington. “It is entirely scalable, depending upon the circumstances. And we now have a society that tends to want to jump over the fence and onto the 18 acres.” Plans by the U. S. Secret Service and the National Park Service call for the new fence to be about 14 feet high, compared to the existing fence that is about 7 feet high. Entrance gates would be slightly higher. The new fence would have 1¾ inch pickets and “anti-climb” features such as intrusion-detection sensors. Renderings also show spikes along the upper edge similar to the “pencil point” spikes that were added to the existing fence in 2015. Mills + Schnoering Architects of Princeton, New Jersey, has been working on the design, which must be approved by the National Capital Planning Commission and the U. S. Commission of Fine Arts. One challenge is “reconciling contemporary standards of protection with the historic and highly symbolic property,” according to a letter from the Fine Arts Commission to the Park Service and the Secret Service. Federal officials say the fence will be in keeping with the Park Service’s design standards for the historic mansion and surrounding area, which draws millions of visitors a year. The planning commission did not take any formal action on the proposal at its meeting. A preliminary schedule calls for the taller White House fence to be under construction by 2018. A later phase would include a new fence to surround the nearby Treasury Department and the Eisenhower Executive Office Building. Memorials enshrine what we as a society want to remember. But the places, people, and stories that we memorialize, and the audiences who engage with them, are in fact constantly changing. A memorial tells its story through subject matter and design. This story is often complex and multi-dimensional as a memorial’s interpretive elements embody ideas of identity, culture, and heritage, and each have intensely personal interpretations for every individual. As a national capital, Washington is a place of collective memory. The wealth of monuments sited throughout the city take on heightened significance as they reflect relationships among nations, of national remembrance, and of many important events and figures in our history. Often the traditional and fixed nature of memorial design does not allow for adaptation and redefinition over time, or encourage more than one interpretation of a given narrative. The traditional approach to developing memorials in Washington has resulted in a commemorative landscape that is thematically similar and increasingly land-intensive, which poses challenges for Washington’s urban park system, and has long-term implications for the potential uses of a memorial's surrounding park setting. The planning and design process is often costly and time consuming, which limits opportunities to groups or individuals with significant resources. Current trends raise a number of questions about the future of Washington’s memorial landscape and the ability to provide space and resources for future commemorative works. 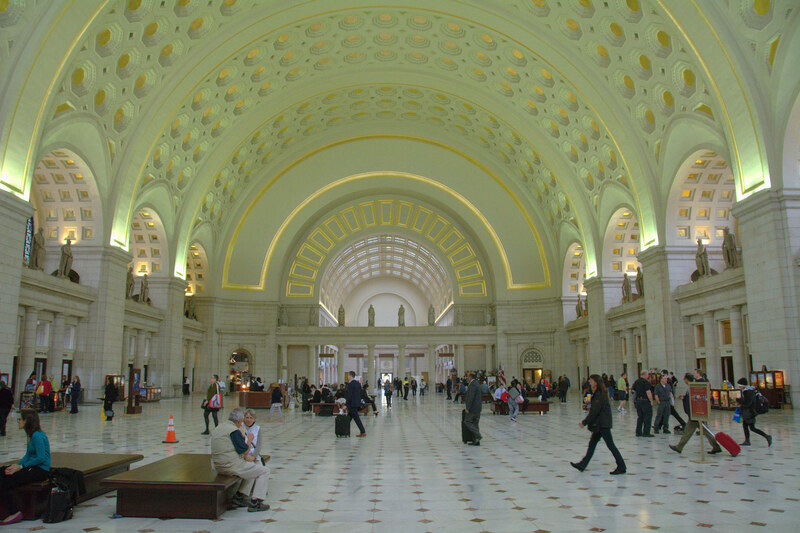 Location The competition proposals should be based on specific places or areas in Washington, DC. Proposals may take a physical form or may be virtual. Preference will be given to teams that propose a site or sites outside of the National Mall. The following locations are suggestions reflecting typical opportunity sites for new memorials in Washington: Near the monumental core: The Belvedere Within a residential area: Randle Circle or Tenley Circle Around a natural setting: Hains Point For more information on the types of sites in Washington, DC, and these sites specifically, please visit the project website -http://future.ncpc.gov Provocations The following provocations are meant to fuel and direct the competition submissions. Concepts that address several of these provocations are more likely to meet the competition's goals. Memory • How can we commemorate events or acts with long time frames that are still occurring today? • How can memorials be adaptive or temporal rather than permanent? • How can a memorial’s narrative continue to evolve as new generations evaluate its significance within the larger context of our ongoing national history? Identity • How can memorials advance dialogue around contemporary social, economic, health, or ecological problems that have historical roots? • How can memorials look forward while acknowledging a historical event or person? • How can memorials contribute to a more inclusive and more representative national narrative? • How can memorial designs encourage more, rather than fewer, sponsors? Placemaking • How can we memorialize, while also balancing the need for active public space? • How can memorials engage more diverse audiences, in more flexible and interactive ways around a given narrative? • What unconventional physical or digital forms could memorials take? • How can memorials respond to various neighborhood contexts and scales while also commemorating national events or serving the national interest? The competition partners invite participants to propose additional questions. The goals of the competition are to create new approaches to and forms of memorializing: • That advance a framework for the planning and design of commemorative works in the 21st century. • That demonstrate how temporary, mobile, interactive or adaptive displays can provide powerful and memorable experiences that are cost-efficient. • That develop ways to commemorate that are inclusive of multiple narratives and have the potential to be flexible as perspectives change. • That honor the scale, context and national significance of Washington, DC. The competition results will be displayed online and at an exhibition in Washington, DC, published in an illustrated report, and inform NCPC, NPS, and their partners on future design and policy opportunities. The deadline for registration and electronic submission of the request for concepts is 11:59 p.m. EDT on May 4, 2016 at the competition website. Last week, we highlighted historic mid-century modern architecture photographs digitized by the University of Southern California in Los Angeles. And now farther north on the west coast is another new archive find. The Seattle Public Library Special Collections—located on the top floor (nope, not relegated to a dusty basement as is often the case) of the OMA / Rem Koolhaas and LMN-designed Central Library in downtown Seattle—just digitized over 2,400 historic Space Needle construction photographs (and a daily construction log, too). 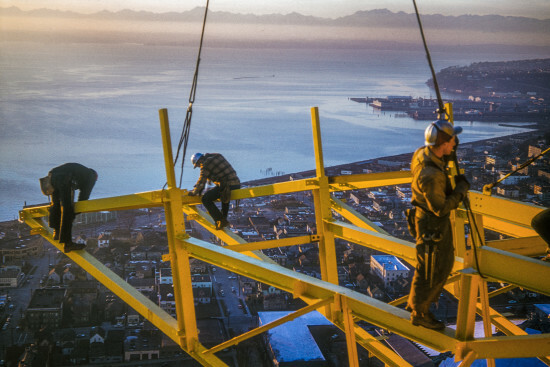 Local Seattleite professional photographer George Gulacsik captured the construction details of the famous 605 foot tall Seattle landmark that took less than a year to build: there are photos of the cement pouring preparation, the painting, the fin raising, the visitors, onlookers, and more. Gulacsik took the photos between April 1961 and October 1962. There is even a photo of former President John F. Kennedy's motorcade taken from above, as Kennedy made his way through Seattle to give a speech at the University of Washington in November 1961. Many Gulacsik images were used as marketing in a 1962 promotional publication, "Space Needle USA." Gulacsik's wife donated his photos in 2010 after he passed away. The collection is named after him. The Space Needle is said to be inspired by the Stuttgart TV Tower in Germany. The design is typically credited to architecture firm John Graham and Company, Victor Steinbrueck, and John Ridley, who worked with businessman Edward E. Carlson and his napkin sketch concept. "Graham was excited by the challenge, and assembled a large team of associates including Art Edwards, Manson Bennett, Erle Duff, Al Miller, Nate Wilkinson, Victor Steinbrueck, and John Ridley," explains History Link, the online nonprofit Washington State history encyclopedia. "In working to translate Carlson’s doodle into blueprints, they explored a variety of ideas ranging from a single saucer-capped spire to a structure resembling a tethered balloon. Steinbrueck hit on a wasp-waisted tripod for the Space Needle’s legs and Ridley perfected the double-decked “top house” crown." Now we can view the collection from our armchairs, couches, and desks. It has been a little over two and a half weeks since the last submissions rolled in March 4 for Re-Ball!, an international competition hosted by Dupont Underground. Raise/Raze, the winning design by New York City-based architecture firm Hou de Sousa, emphasizes interactivity and social interaction, inviting users to make their own mark on the building (and destruction) process. Re-Ball! is an organization seeking to bring life to a defunct trolley station under Dupont Circle in Washington, D.C. The station opened in 1949 and was abandoned in 1962, when the city stopped its streetcar service. (Though in the 1960s parts were used as a fallout shelter and later a food court.) 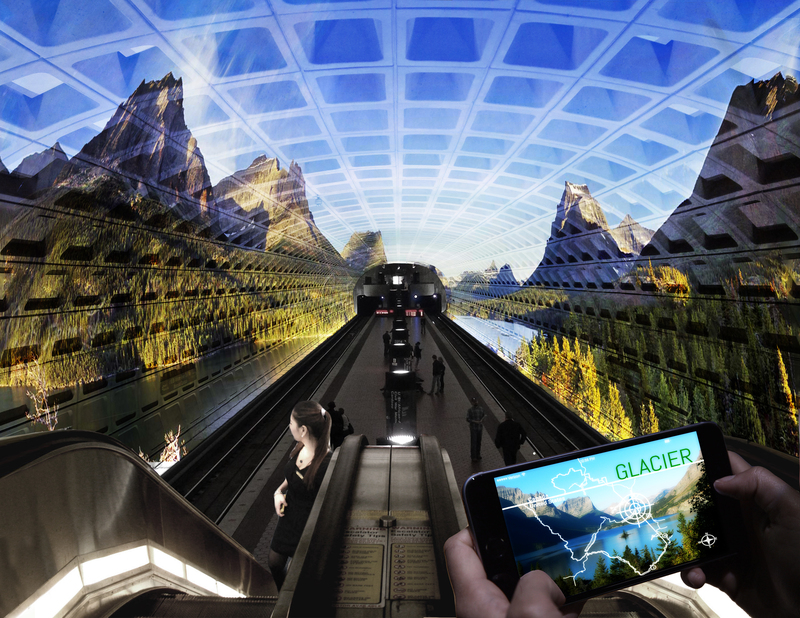 Dupont Underground signed a five-year lease with the city in 2014, and hopes to create a Low Line-like experience, yet with a more cultural bend, hosting art and design exhibitions, community and educational events. They also want to host pop up restaurants and retail, creative incubators, and more, both temporary and permanent. 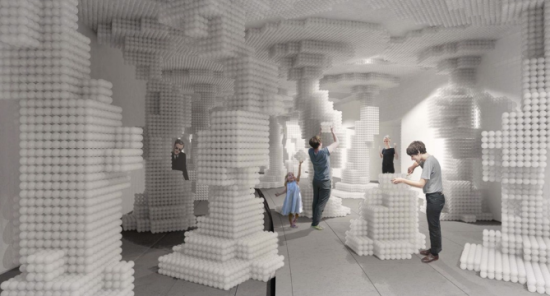 To start activating the Dupont space and get those creative juices flowing, the competition asked entrants to create a site-specific installation repurposing over 650,000 translucent white plastic balls used in a former National Building Museum installation last summer. They asked entrants to create a design to help fill the 14,000 square foot east platform, now mostly raw concrete and subway tile, beneath Dupont Circle. “The winning entry should be thoughtful, provocative, witty, safe, and executable on a limited budget, in a limited time frame, and within the confines of the site,” Dupont Underground wrote in their competition brief. “Raise/Raze is like sand in a massive sandbox; it allows its users to alter their surroundings with ease,” said the designers in a statement. To see the installation when it opens April 30, you’ll need to make a reservation. Advanced admission tickets are available via the Indiegogo campaign. The installation will run through June 1. Check out the finalists here and a gallery of all proposals over here. 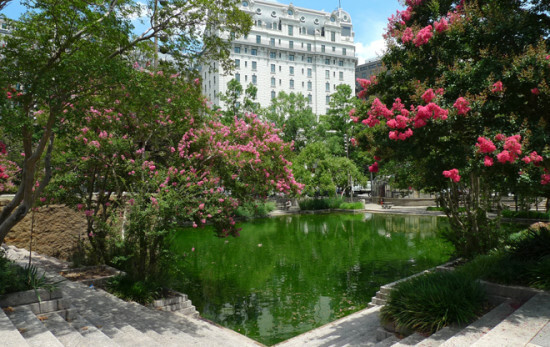 Adored by some who consider it a neatly sculpted Modern landscape worthy of protection, and loathed by others who see it as an alienating 1980s byproduct that perpetually falls short in its public duties, Pershing Park conjures up some polarizing perspectives. Located in Northwest D.C. on Pennsylvania Avenue, the park's condition is shopworn, but its redevelopment continues to divide opinions. Home to the WWI General John Pershing memorial (a protected monument) Pershing Park was designed in 1981 by landscape architect M. Paul Friedberg. At the time it was a tranquil environment, a welcome contrast to the hectic urban surrounding. Its layout is ordered, and clean lines run through the park, maintaining a harmonious and symmetrical relationship with the water and greenery—at least, that was what was meant to be. Once upon a time, the park promised to be a place to ice-skate in the winter and relax in the summer. The fountain and ice-skating framework however, have been defunct for years. The water's serenity and sense of calm is easily disrupted when upkeep is ignored as litter fills the pool and steps become dirty. Paving slabs are riddled with cracks and are uneven, the slick lines now lost. It's no coincidence that that idyllic images shown on the American Society of Landscape Architects's website (via The Cultural Landscape Foundation, TCLF) are clearly dated (though the date of the photographs is unknown). Now, the World War I Memorial Centennial Commission is eager for change. A competition which the commission ran in 2015 resulted in architect Joseph Weishaar, landscape architect Phoebe McCormick Lickwar and sculptor Sabin Howard winning with their proposal: The Weight of Sacrifice. The design does away with the water. A problematic feature, seen as a catalyst to the park's downfall, it is replaced by a lawn that is partially surrounded by 10-foot-high walls that hug the perimeter, using bas-reliefs to inform visitors about WWI. The aim is to provide more space to relax, but it also sees a change in the park's role, becoming a place for historical education too. Costs are estimated at $38 million by the commission who has currently raised $6 million in their bid to bring about change. Change however, may not come so easily. On the other side, those who fight for the parks protection are attempting to place the park on the National Register of Historic Places. If successful, any changes, regardless of money raised, would be significantly curtailed. It's not hard to see both sides of the argument. On one hand, to maintain the current style and layout of the park pays respect to the WWI General John Pershing memorial of which it was designed to do. On that note, any change would disrupt the relationship between the park and the memorial. Conversely, the space's decline surely implies that it is unsuccessful, so much so that none bother to maintain it. For this to be fixed, more need to be welcomed in and more space is needed to facilitate this. Joe Weishaar argues that the dropped water feature is a “blind spot” and is hence ignored. Sculptor Sabin Howard envisions an “uplifting story of transformation, showing how noble the human race can be.” While the campaign for change gathers steam, the fight for protection does have some weight in the form of Charles Birnbaum, president and CEO of The Cultural Landscape Foundation (TCLF) and Darwina Neal, former president of ASLA among others. Here, Birnbaum argues for “making some changes, but keeping the signature and character-defining features intact.” From a withdrawn perspective, one cries out for collaboration between the two parties. Jared Green of The Dirt points out: "Whatever the outcome, one long-term question is: can this park be well-maintained moving forward? If not, we may be back to where we are now 30 years in the future."